We’re known as ‘the skin geeks’ of the PR world, and our clients will certainly back that up! But our Social Media team is also growing, and they’ve taken over this week’s blog to show you a window into their world – complementing the brilliant print and digital publicity that emerges from RKM’s doors with wonderful imagery, witty captions and short, snappy commentary for clients that leave you clicking ‘follow’ without a thought. People want to follow brands that inspire, reflect and show a lifestyle that people can identify with. Brands that achieve real cult followings will have produced a real ‘family’ on their Social Media channels, and that’s exactly how we aim to work with each client here at RKM. This works for the aesthetic as well – people want to follow aspirational content, which is exactly what we found working on the project to launch Hydropeptide’s UK Social Media – see their platform here. Sales are the most important thing for any brand, and everything we do at RKM is geared to support this. Digital and Social Media coverage are the easiest way to trace and track sales, so it’s something we take great pride in. 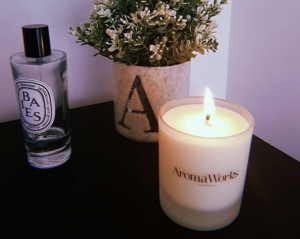 One of our favourite accounts, AromaWorks, has seen the effect of our influencer outreach directly impact their sales. We don’t just create and post engaging, pretty content (which we do very well), we also know the importance of putting our clients into the hands of other influential people to tell their own story and we are fortunate to work with a number of really great influencers. One of the most satisfying things about Social Media is that your activity is so traceable, and you can see what works and what doesn’t in terms on platforms with their audiences and engagements. Mustela’s recent Skin-Type Campaign was a real highlight for the team; getting stuck in with local pharmacies and influencers to emphasise the award-winning baby skincare brand’s specialised offering of products for babies and children of 4 different skin types. 4 key influencers were engaged to test the products on their young children and see the results – and obviously the feedback was glowing! 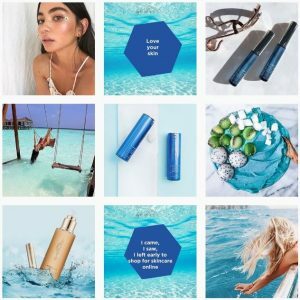 We saw fantastic coverage across all the influencers’ platforms and Mustela’s UK channels, and country-wide engagement as a result of their genuine endorsements. 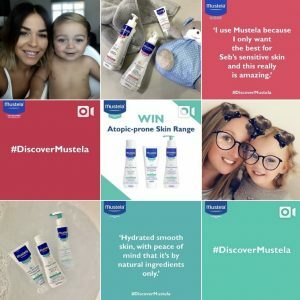 Over the course of the month we ran the campaign Mustela’s Instagram following increased by 12%, and on Facebook we saw their engagement rise by an enormous 213%. Dermalux LED is an account that we work across both PR and Social Media, and have really seen the benefits of managing their channels when inviting influencers to try the world renowned treatment. Influencers have such power over their followers now, that it’s a crucial element of promoting a brand, and can drive traffic directly to the website of a brand or client within moments of their post/story going live. With Dermalux LED we’ve collaborated with big-time influencers and bloggers like The Collyer Twins, Joely Walker (also beauty editor of Grazia) , Anisa Sojka and Inge Van Lotrigen (also beauty writer for The Daily Mail and beauty editor of Cosmopolitan). We are currently working on the launch of THE new beauty web platform: Skinforia. Having launched their platform from scratch we have been able to create GIFs and images to match Skinforia’s target audience perfectly. 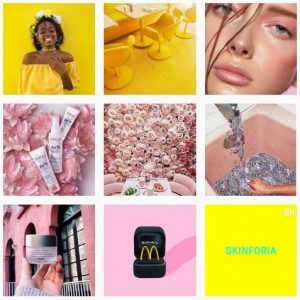 Being a more knowledge-lead platform that fits all skin, hair and body concerns, we had to match know-how with the fun personality that millennials look for on social, while also showing off the range of brands that they offer. We’ve had a great time so far, and the platform is still growing..
We managed, planned and grew SCRUBD’s Social Media platforms from their launch in September 2017 to July 2018 and grew their following to over 2,300 on Instagram. 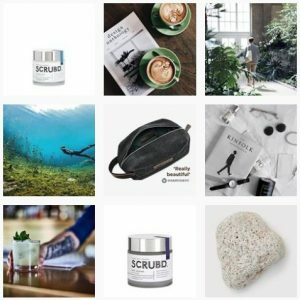 We did this using a mixture of product posts, inspirational lifestyle shots, blogger outreach, ingredient images and much more! Our team cut their teeth on Facebook Ads Manager with this brand, and thankfully they were trusting, and saw brilliant results! 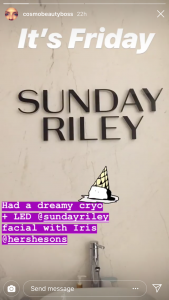 This is another client that gave us the keys to both their Social and their PR, and this hugely helped in growing their presence, and eventually helping to win their GQ Grooming Award this year (2018) for Best Anit-Ageing Innovation with their Anti-Ageing Face Serum for men – after less than a year of trading! Our Social Media offering at RKM encompasses community management and platform management, competitor analysis, monthly post planning, reactive posts, influencer engagement, graphic design and templates, competitions and collaborations – to name a few! What makes the real difference is our ability to transmit the message at the heart of your brand to your following. People want to understand why they should buy something and why they should have it in their lives. We know that making something personal will encourage people to follow or swipe up through a link, rather than keep on scrolling.